Hailing from Missouri with production at Super Rat Machine in Kansas, Tree was one of the first companies to make a splined BMX sprocket. 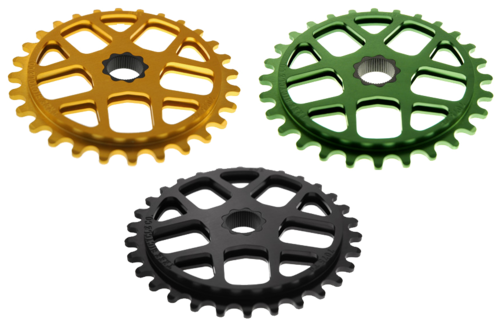 The Tree Lite splined sprocket was what saved BMX cranks on fixed gears for me. 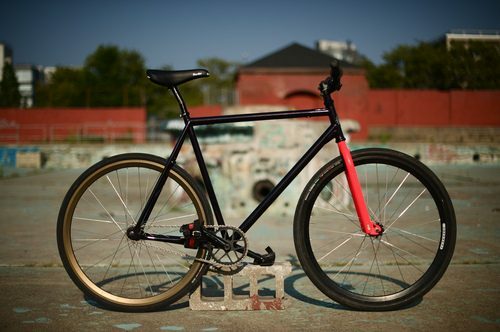 I know I’m not alone on this either because half of Tokyo is also riding these sprockets. Anyone I know who has switched to a BMX drivetrain is also riding one. It’s probably the simplest solution for the complex problem of riding a bolt-on sprocket; make it splined! I’ve had mine on since July and it’s given me zero issues. The last set up I had with the Profile race cranks and Volume Krull looked nice and performed well enough, but I felt that the Tree was a more elegant solution. 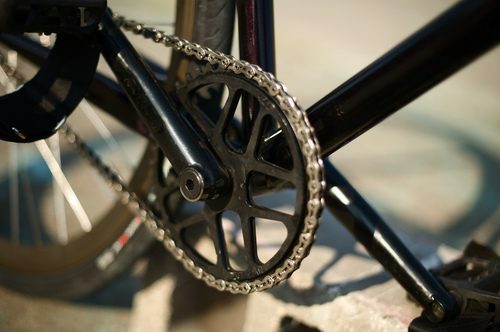 Since I ride a larger bike, I like the way a bigger sprocket looks. Currently, the Tree Lite on my Bruiser is a 42t. If I had a 30t on, it would probably look dainty on the bike; don’t be mistaken, these things are beefy. It’s made from 5/16″ thick 7075 aluminum and with a unique cross-section, the Lite sprocket looks like a piece of art. The splined version weighs only 96 grams for a 30t too. Not bad. Most people are riding more compact tooth count now, partially due to the scarcity of the 42t sprockets; Milwaukee sold out in hours! With a 33t ring up front, you could easily ride a 12t ot 13t cog in the back and with 38c tires, come in around 74 gear inches or so. Sprocket Making Video from andy chapman on Vimeo. The only negative thing I can say about the Tree Lite sprocket, isn’t really a bad thing as much as it is the nature of being a small company and funding your own production; availability. Dans Comp usually has some 28t sizes in stock, but the larger sizes are really hard to find. Maybe it’s possible to have your LBS contact Tree directly? I don’t know but if you can get your hands on a higher-tooth count ring, do so because it’s a legit product. With other companies like Profile making their splined sprocket, it will come down to the aesthetics and design of the sprocket itself. That’s another thing Tree has going for it, the design of the ring is nicely proportioned. Hell, they know all about sacred geometries, as seen by their older Flower of Life shirt. Tree certainly innovated the BMX industry with their design and now the fixed gear community has another re-appropriated product to use. In the future, more companies will follow suit with the idea and it’s all thanks to Tree. I commend Tree on their innovation and look forward to see what else they come up with.